Now that the explosive popularity of “Pokemon Go” has brought augmented reality technology within the reach of ordinary people, a tombstone company in Chiba Prefecture is taking it beyond the grave. By allowing people to “catch” pre-recorded video messages from the departed in cemeteries, the firm hopes to create an effect similar to snagging Pokemon characters, but with a more personal touch. 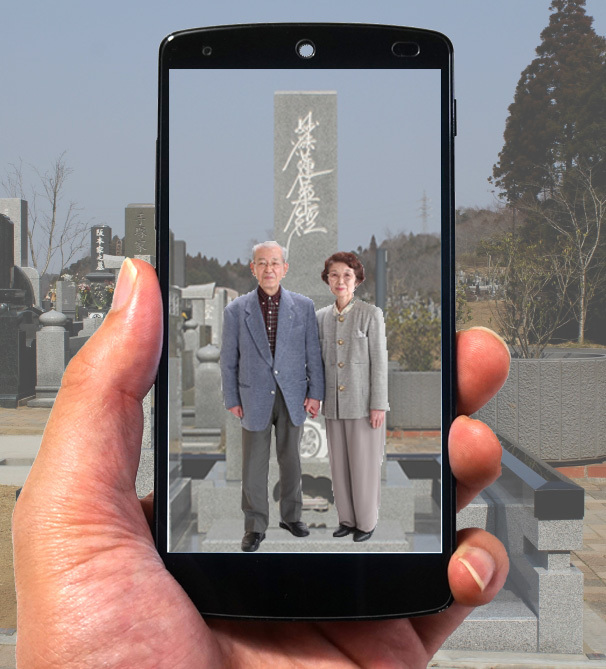 Yoshiyuki Katori, president of Ryoshin Sekizai in Katori, Chiba, said the firm’s new app, named “Spot message,” realizes his longtime dream of preserving memories of the deceased for the living. “My uncle, who ran a paint store, died eight years ago after he fell from a tall structure at work,” said Katori, 33. 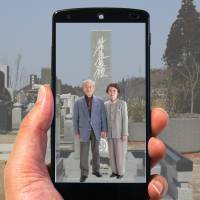 Katori then came up with the idea of using augmented reality to plant video messages from the dead at their resting places and other locations dear to them. The concept mixes virtual images with real-life landscapes captured by the camera of a smartphone or tablet. The web-based service targets people who want to prepare videos and photos to be shown to their families and close friends after they die, Katori said. But the service can also be used for other purposes: A husband could, for example, leave a surprise message at the spot where he proposed, to be picked up by his wife on their anniversary. Or, people could prepare congratulatory messages for friends who are climbing mountains, to be retrieved at the summit, he said. Anyone can use the service for free by downloading the app, registering with the firm and submitting up to 10 messages. Paying members can store larger amounts of data on the firm’s cloud servers and can keep up to 30 messages and share them with up to 200 people for a monthly fee. The timing of the app’s launch — just one month after the release of Pokemon Go — is purely coincidental, Katori said, but he is sure that now is the prime time to market the service. More than 100 people downloaded the “Spot message” app in just one day since the Android version’s launch on Monday, he said. A version for iPhone will be available in early September.